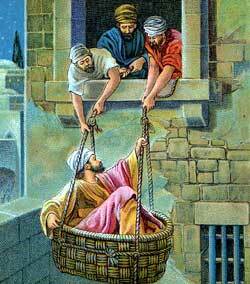 The Jewish teachers want to kill Paul, but his friends let him down to the ground in a large basket, and he escapes. HE JEWS OF Damascus were surprized when they found Saul in their synagogs worshiping with the disciples of Jesus. They were even more surprized to hear him preach boldly in the name of Jesus. They asked, wonderingly, "Is not this the man who imprisoned and even killed many people in Jerusalem because they believed Jesus is the Christ? We heard that he was coming to our city to persecute the believers here, and how is it that he now worships with them?" But Saul continued to worship with the disciples, and every day he taught in the Jewish synagogs that Jesus is the Christ. Then he bade his new-found friends good-by, and went away into a country called Arabia. There he prayed much and studied the Scriptures until he understood the words of the prophets who had told about the coming Messiah. Now he saw clearly that Jesus of Nazareth, whom he used to despise as a false teacher, is the very one of whom the prophets had written. From Arabia Saul returned again to Damascus, and preached even more boldly than before. And the Jewish teachers who did not believe in Jesus were unable to prove that his teaching was wrong. When they saw that many of the Jews were beginning to accept the new religion, they became angry with Saul and planned to kill him. They set watchers by the gates of the high wall which surrounded the city, and commanded these men to kill Saul if he should try to escape through one of the gates. Then they determined to seize him before he could even try to get away. But Saul knew about their plans, and so did his friends. These friends believed that God had much work for Saul to do before he should die, so they hid him until night darkened the city. Then they brought him to a building that stood on top of the great wall and let him down to the ground in a large basket. Once outside the city it was not difficult for him to find a place of safety. But where should he go? Saul remembered his friends in Jerusalem--the chief priests and scribes and Pharisees. No longer would they be his friends; for no doubt they had heard long ago that he had ceased to help them fight against the new religion. Three years had passed by and he had never yet brought any prisoners from Damascus as he had planned to do when he left them. No longer would they be his friends. Then Saul thought of the ones whom he used to persecute in Jerusalem. Now he loved them and longed to worship with them. He longed to tell them how the love of Jesus had changed his wicked heart, taking away all the hatred that had made him their bitter enemy. So he came to Jerusalem and hurried to find the apostles and their unfaithful friends. But the first meeting of Saul and the other disciples was not a happy one. The news of his conversion had never reached the ears of these people, and they were afraid that he was only pretending to be a disciple. They thought he might be planning to do more mischief to the work of God by acting friendly now. This was a sad time for Saul. He knew the disciples of Jesus had reason to be afraid of him; for they remembered how roughly he used to treat them, and even cause some of their number to be killed. He saw they did not know about the great change that had taken place in his heart and life; for now he loved them as brothers and sisters. Then Saul found a friend in the kind-hearted man named Barnabas, who was also a believer. Barnabas listened to his story about the vision on the road to Damascus, and about the change this vision had caused in his life. And Barnabas felt sure that Saul was now a true believer in Jesus. So he brought him to the apostles, and told them to receive Saul kindly, for Jesus had spoken to him from heaven and had called him to be a follower, just as they had been called. After this time the church in Jerusalem received Saul gladly, for they rejoiced because God had changed their enemy into a true friend. And Saul visited with Peter for fifteen days. During this time he went to the synagogs where he sued to seize disciples and beat them. Now he taught there boldly in the name of Jesus. His old friends were amazed at his teaching, and soon they showed their displeasure toward him by planning to kill him as they had killed Stephen and others who believed in Jesus. Saul knew about their ill feelings toward him; but he was willing to give his life for Jesus just as Stephen had done. God, however, had more work for Saul to do, so he appeared to him one day while he was praying in the temple, and told him to prepare to leave the city quickly, because his former friends would not believe that he had seen Jesus in a vision. God told Saul that he must be a preacher of the gospel to the people who lived in other countries, for Jesus was the Savior not only of the Jews but of the Gentiles, too. After Saul had seen this vision the apostles heard about the plans of the Jews to kill him, so they took him away from Jerusalem and brought him to the city of Caesarea, on the sea-coast, where Philip had made his home. And from this place Saul took ship and sailed to Tarsus, the city in Asia Minor where he had been born. And after he left Jerusalem the excitement of the unfriendly Jews died out, and rest came to all the believers who had been troubled by these wicked men. During this time of rest and quiet the church continued to grow in numbers in every city and village where the gospel story had been told.